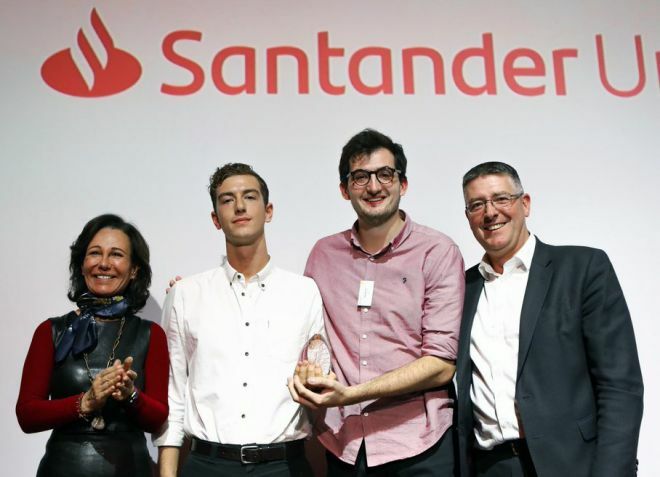 A business formed by Kingston School of Art graduates that offers an eco-friendly alternative to MDF made from potato peelings has won top honours at the annual Santander Entrepreneurship Awards, landing £25,000 of seed funding in the process. 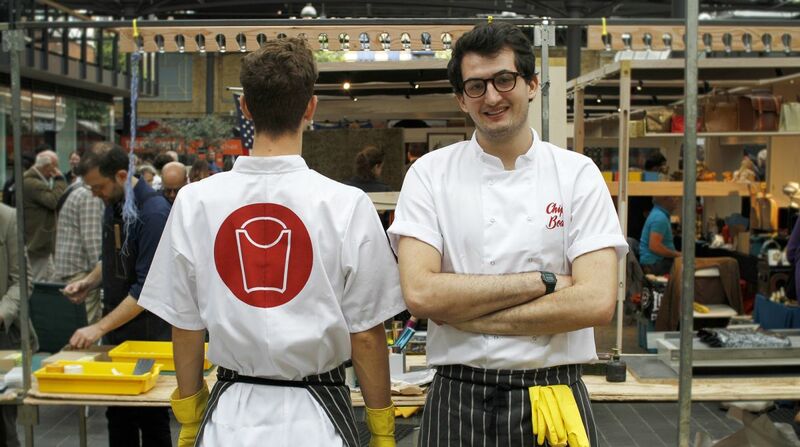 Chip[s] Board®, founded by design graduates Rowan Minkley and Rob Nicoll, saw off competition from 80 entries from universities across the country to pick up the award in the non-tech category. The pair pitched their business to a packed room of industry experts and entrepreneurs at the final in London alongside six other hopeful graduate businesses - scooping top prize as selected by a panel of judges. 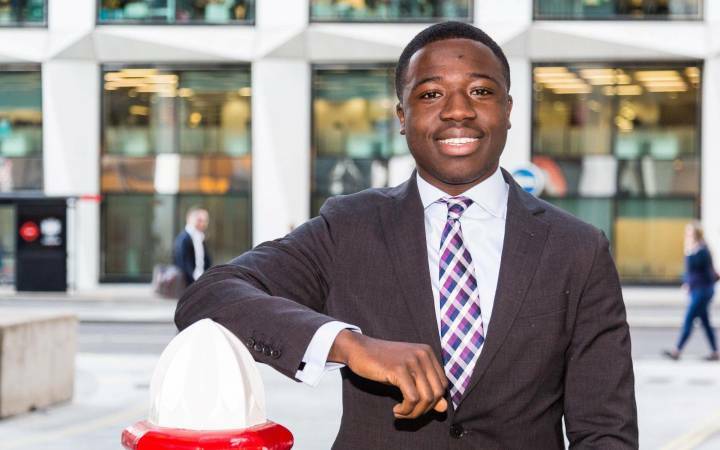 Since the awards were first launched, Santander Universities has funded more than £420,000 in support for budding student entrepreneurs, offering universities the chance to showcase entrepreneurial talent from across the UK. 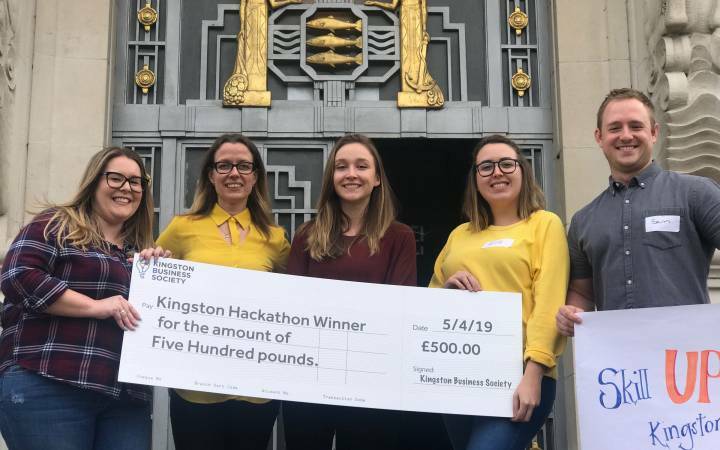 Kingston University has also received more than £500,000 towards various projects including internships, supporting entrepreneurial endeavour around the University and a Hack Centre. Founded as part of their final project when studying at Kingston School of Art, Chip[s] Board was driven by a desire to create an impactful product from waste materials. "We were investigating bio materials, extracting starch from potatoes to produce a simple bioplastic," Rowan explained. "This left us with a lot of remaining waste and, with the goal of minimising residual waste, sparked an idea. We realised that with a bit of work we could create an environmentally friendly and sustainable alternative to MDF - with the advantage of Chip Strand BoardTM decomposing quickly in an industrial compost." L-R: Ana Botin, Executive Chair of Santander UK, Rowan Minkley, Rob Nicoll and Matt Hutnell, Director Santander Universities.While at the initial stages of the product, the pair sourced potato peelings from a local restaurant Rowan was managing while studying. This led to a laborious travel schedule while the material went through various stages of the transformation process. "We sorted the potato peelings at home and then cycled to the University to process them, returning to the restaurant to finish the boards," said 24 year old Rob. "Then back to university to take them to the workshops and turn them into products. 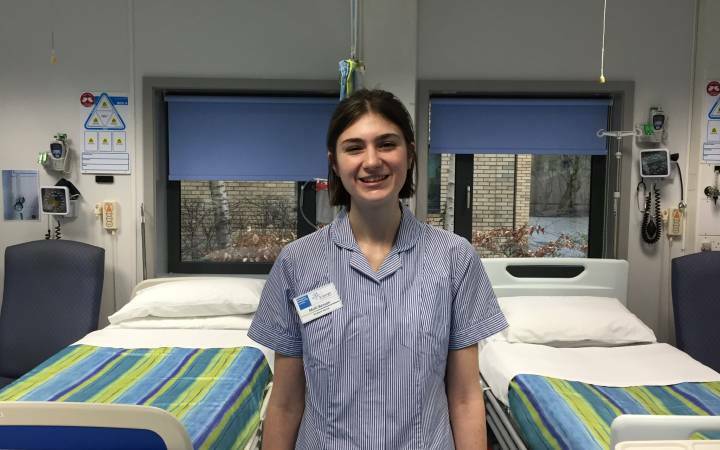 The smell is quite unique, our housemates didn't really like us for a couple of months while we got up and running." 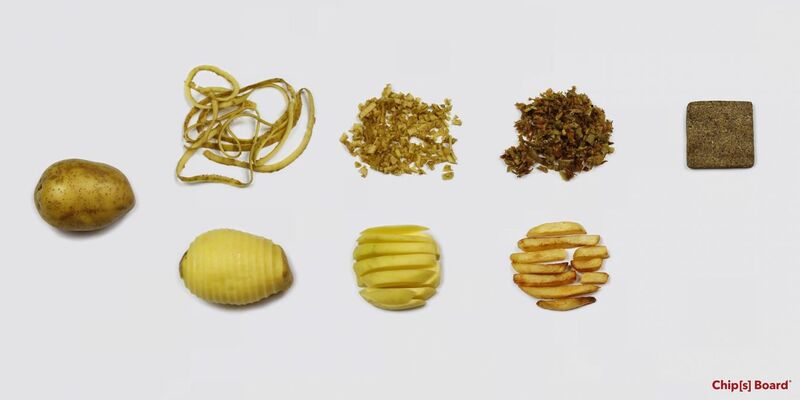 With roughly six kilograms of potato peelings producing one kilogram of Chip Strand BoardTM, the company requires a constant supply of peelings. "We're currently working with global potato processor McCain," Rowan said. "They can see the appeal of us collecting their waste and turning it into something highly sustainable that doesn't contain formaldehyde or any other toxic resins and chemicals found in MDF." The award tops off a demanding year for the company and its young founders, who have come a long way since transporting potato peelings around Kingston. Chip[s] Board® has won a Creative Conscience gold award, the July Shell LiveWIRE competition and the product has been exhibited in Los Angeles and featured on a BBC4 TV show. "We completed our first round of investment, celebrated our first birthday and moved in to a new home in Shepherds Bush Market called Open Cell which is a space dedicated to bio-based companies," Rob explained. "We've also welcomed a new co-founder on to the team, fellow Kingston University graduate Greg Cooper, a biochemist who will progress material development." The team have also found the time to come up with their next product - a marble looking plastic called ParblexTM, made once again from industrial potato waste. 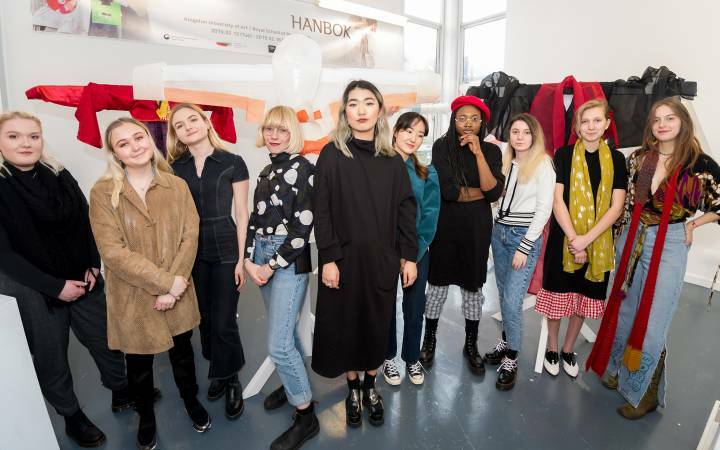 Sustainable fashion designer Isabel Fletcher, who completed her foundation degree at Kingston University, is currently using ParblexTM to create buttons and there is interest from a company to use the material to make frames for eyewear. Rob and Rowan hope they can make a real impact on the world, with their efforts seeing single use MDF and chip board replaced as the go to product for temporary structures. "Some products and constructions have to be temporary, so we should use materials especially designed for this" said Rowan. "Events built with the right materials will drastically cut down on the waste materials normally left behind. We want Chip[s] Board® to inspire more young people to find creative solutions to issues affecting the world." Find out more about studying design at Kingston School of Art. The process devised by the enterprisng graduates turns waste potato peelings in to Chip Strand Board.